Note: I recieved this email from Mrs. Mom whose husband had recieved it from a LEO friend. I have not verified it as true, but it does logically make sense. After ensuring I wasn’t hemorrhaging profusely and didn’t have to make a dash for the hospital, I stayed seated in the car as my wife came around to my door and opened it. I undid my belt and slid the Galco JAK202 Slide Belt Holster, with the gun still in it, off my belt. Why it went off was immediately apparent. The trusty, comfortable, leather holster I had been using for a year and two weeks had done what a baseball glove does after lots of use; It got soft. 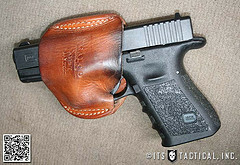 This particular holster carries the pistol outside the waistband, but inside the belt. 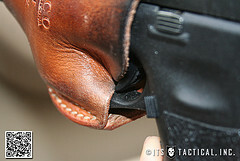 The belt slides through slots in the outer side of the holster. I can’t say I didn’t know the crease had been formed in the holster. I trained myself to be sure that when holstering, to make sure the gun was fully in the holster, with the trigger protected. On this day, did I forget to do that when I holstered up? 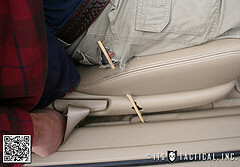 Did the leather finally get so soft that a combination of body movements and interference by the cushy leather seat move the Glock enough to create a situation where the trigger was engaged by the holster? However, if it was the latter, then those of you who use this type of holster need to be aware of its limitations and the possibility of experiencing what I did. Holstering your gun can be just as important as drawing it. Make sure you pay attention when doing so. If your leather is getting soft and worn, be sure that it won’t interfere with your trigger or just replace it. You know, my husband had his Glock (EXACT SAME GUN) accidentally discharge in a perfectly good rigid synthetic holster while taking it off and setting it on the headboard to the bed. Blew a hole through the bed, floor and 2 walls. I have never trusted that gun since and personally, I blamed the unique safety feature that makes a Glock a Glock. While I find the way those guns shoot agreeable I have never carried one for that reason. Aww, poor guy...I'll bet he gets CRAZY razzed for shooting himself in his own behind...LOL But this is a very informative story, which I probably would never have thought about otherwise. Thanks for the tip!! When I carry my "little" .45, I dont put a bullet in the chamber? It is hammerless and I just feel that it is another safety measure? Is it common practice for law enforcement to carry with the guns live??? RDA- When on duty here in GA. LEOs carry w/ a round in the chamber (so do I, even though I am in no way shape or form a LEO.) 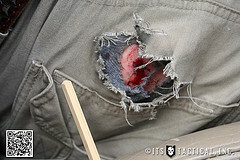 This incident happened because of one thing horse folks know well- leather wears and folds. I'm not going to go into the whole Glock debate, but I DO advise carry in a Level 1 retention holster that has trigger guard. As to why *I* carry w/ a chambered round? Because when a Bad Guy is coming at me, I want to pull and go- and not have to worry about chambering. My shotgun however, has an empty chamber (though is it fully loaded.) The why behind that- everyone knows the sound of a racking slide on a shotgun, and if the BG has any sense, he'll leave a p!ss trail for me to hunt him down with. Police regardless of what they carry ALWAYS have a round in the chamber.89% of all police departments world wide carry the Glock for a reason. Negligence causes Glock discharges not the safety features. I ALWAYS have a round in the chamber of my Glock because the Israeli draw isn't even used by the Israeli's anymore. Too many things can go wrong and it simply takes too much time and too many steps to be even remotely useful. If you don't trust yourself or your pistol enough to carry a round in the chamber you need to change your carry gun and or get some more training. Without a round in the chamber, you might as well carry a hammer. Look up "Tueller drill" and see just how dangerous an empty chamber REALLY is. OK. I'll open the debate. Could NOT have happened with a 1911. I'm all for speedy presentation for law enforcement, but I've never agreed the Glock SAFE trigger system is a valid safety mechanism. If the same action to discharge a pistol (pulling the trigger) is also the EXACT same action to release the safety (pulling the trigger), how does that count as a safety mechanism? Sure it's got the internal block to prevent discharge by shock (dropping), but it's waaaayy too easy to impinge on the trigger accidentally with any number of things. This soft holster was it this time. The true safety of any weapon should be the user's brain. A Glock does not give that extra itty bitty time needed for the brain to decide if taking the shot is right or not. An external safety engages the brain before the shot is fired. It takes milliseconds to flip a safety, but that's all you need to confirm that this weapon needs to fire. Plus, if engaged, it WILL not fire even if the trigger is pressed accidentally for ANY reason. This DA incident should not have happened, but this incident *would not* have happened with anything other than a Glock. I had a holster do the same thing, but did not have an AD. I am a fan of the molded plastic off duty holster for that reason now...and always liked leather better. Never had a problem with my Safari plastic holster and I can draw faster...doesn't get stuckish if that makes sense.